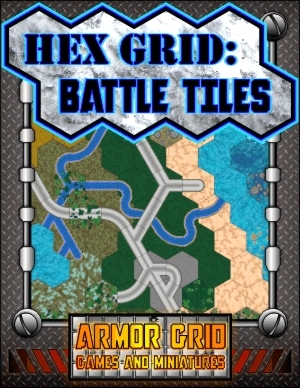 I still need to complete the compiling and testing, but Hex Grid: Battle Tiles should be available soon. That looks very cool. You need some pics with mechs marching around on them. Just to clarify, you can turn the hex grids on and off right? Yep! 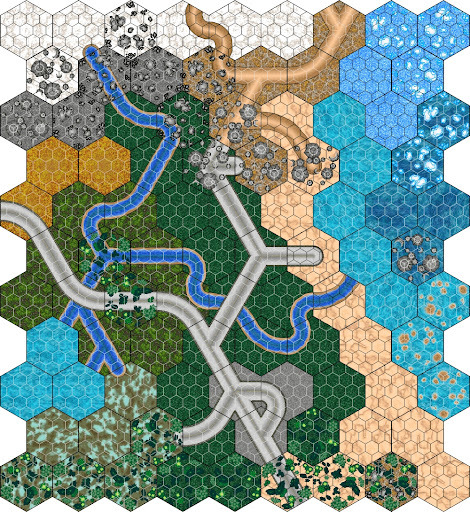 All layers can be turned on or off, so you can make them as simple as just a blank six inch hex, or as complicated as a desert background with dirt roads, a river, a paved road as a bridge, craters, vegetation, an overlay of fog, a white (actually very light gray) 1" hex grid for individual troops, and a black 3" hex grid for vehicles! Are you planning to do them with and without the small hex overlay? Edit: DUH! WaffleM just said that, Dave! Wake Up!! Great map and terrain pieces. 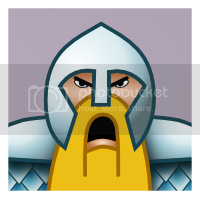 What I like about this product idea is that is it not just for Armor Grid. There are several different gaming possibilities. I can't wait to get my hands on a set. Awesome idea, I can't wait to see it... buy it, hopefully. How will the hex panels interlock? I really want to get a hold of this set I love me some hexes, its so much more intuitive than playing on a grid, regardless of what you are playing. I hate to even ask (all my projects take way longer than I expect) but any idea of a release date? This set has got my mind churning a hundred miles an hour...so I was wondering how long my waiting will last. Also does one f the textures match the texture for the Armor Gird terrain set? I'm hoping to release it at the end of next week, but more realistically I should say that it will be released before the end of the month. I just swapped out a few of the terrain textures and that lead me to adding two more. So currently the terrain background count is at fourteen, and I'm tempted to throw in six more as bonuses. The bonus ones would be the two dungeon tiles, lava and slime fields, and two star scapes. These don't really fit in with the different layers or the overall outdoor theme, so they may just have to wait for another set. 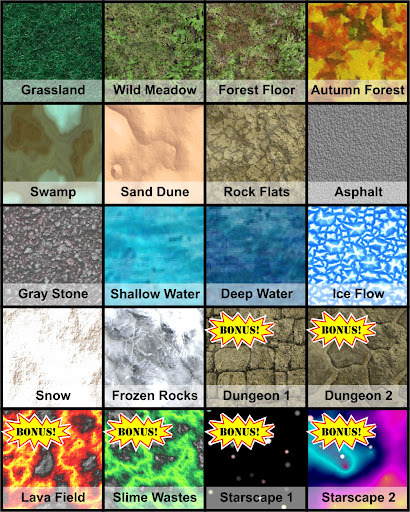 Most of the textures from the Armor Grid: Terrain Pack -->LINK<-- are used here. The rivers do not use the same texture as the water tiles (the water tiles do match the Terrain Pack), as it needed to look more like flowing water. The other reason I decided not to use the same texture for the rivers was that in my Mech Attack games I treat rivers as Rough Ground instead of Shallow Water. This allows Troops to cross rivers, but not lakes. Oooooh! you little devil! I am well and truly teased! Do you plan to make layers to print "terrain transition" hexes? I seriously can't wait for these!! I'll have to make sure I have the supplies on hand to get them on my table ASAP. No joke... really excited about this! Any chance of a closeup of all the textures that will be included? Sorry, no transition terrain hexes. With fourteen different terrain textures, plus four bonus textures, the number of combinations would make transition terrain hexes too complicated. Speaking of terrain textures: Onemonkeybeau, here's your close up! Those textures are lookin' nice. I think transitional hexes could be a pain but it might be doable if you use a layered pdf. One side could be the base texture all the way across and then the other side could be one of the 14 textures being transitioned. That might be a very slow PDF though (The Dragon we are working on has less than 10 layers and it refreshes each layer when scrolling pages, slow but customizable). It would also be cool to get those on Onemonk's bases and trays. Now available at Wargamevault.com for just $4.95US! You can check it out -->HERE<--! I just wanted to let everyone who picked up Hex Grid: Battle Tiles that I've applied an update to realign the 1 Inch Hexagon Grid Layers. This update eliminates the need for the 1 Inch "flipped" layers and makes it easier to match neighboring tiles. 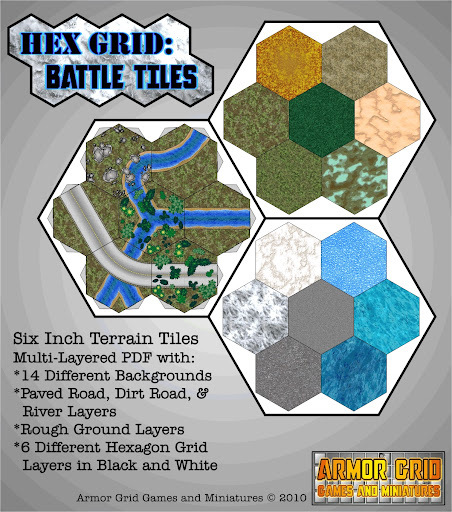 To apply this update you just have to go to the Hex Grid: Battle Tiles product page LINK, log in, and download another copy. If you have any questions about this update please let me know. Hi, Can you check the colour balance for the Forest Floor, in this pack, compared the bases pack, please - I think it is off. edit: I just downloaded fresh versions and checked. The bases are slightly lighter in the darker areas, but this was deliberate to keep them from looking too blotchy. They may not be identical, but they are complimentary to each other. If you'd like the bases to perfectly match the tiles, you could print out a tile with the appropriate background and then print blank base shapes on the same page. You may have to redraw the shapes to the center of the page, but this will give you an exact match.